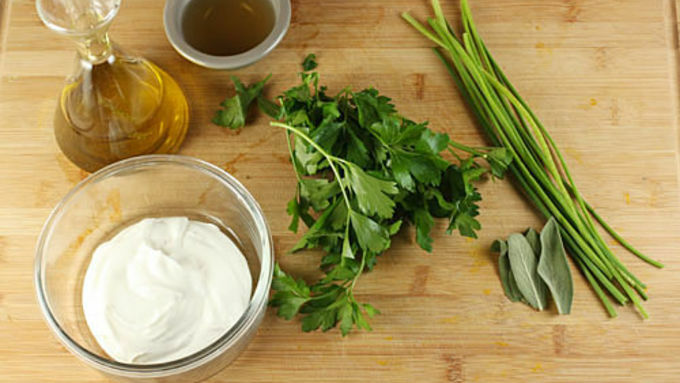 Mix the Greek Yogurt, herbs, apple cider vinegar, olive oil, and a pinch of salt and pepper in a small bowl. This is the dipping sauce for the fritters. Keep it in the fridge until needed. Any extra is great as a salad dressing! Get your frying station ready by heating your oil in a heavy pot. Use a deep-fry thermometer to ensure correct temperature (350°F). 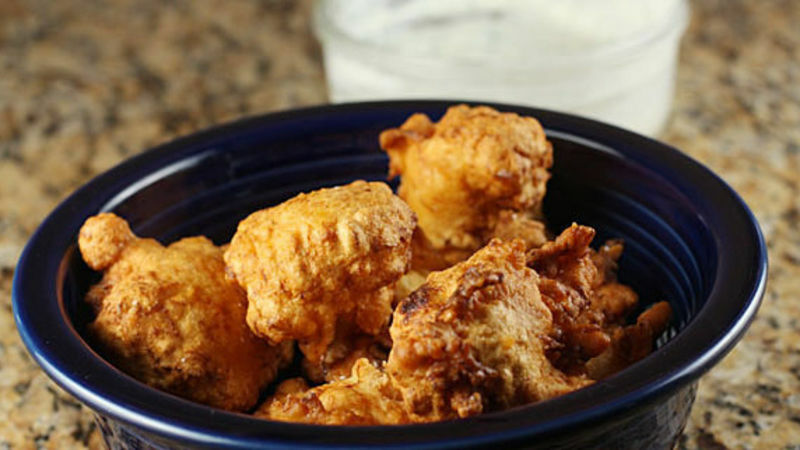 Make sure you have this ready before you make the fritter batter. On the butternut squash, you could either roast a whole one and then use the extra for a different dish or just use frozen squash. Cook it according to package and then roughly mash it up. In a medium bowl, mix Flour, baking powder, and a pinch of salt. In a separate bowl, mix milk, maple syrup, and egg. Mix liquids into dry ingredients and stir lightly to combine. Try not to overmix. Fold in mashed butternut squash. Try to be gentle with it. 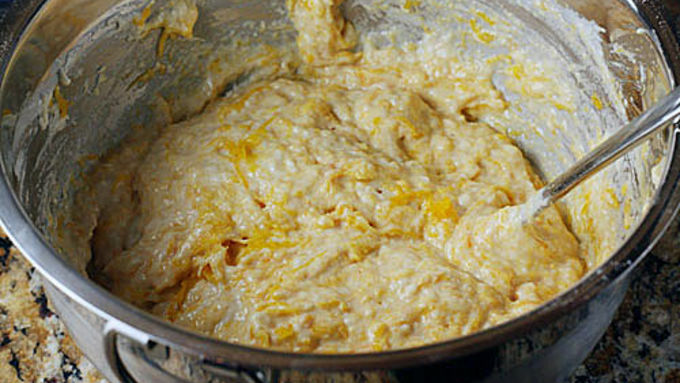 Drop heaping Tablespoons of batter into 350°F degree oil. Work in batches and cook the fritters until they are nicely browned all around and cooked through. This should take 6-8 minutes.Remove fritters to a paper towel to drain and season immediately with a pinch of salt. Serve as soon as possible with green goddess dipping sauce! There's an old saying that goes, "Anything fall can be frittered." Ok. Actually, I just made that up. But it's pretty much true! Almost any fall flavor that you can dream up can be made into a fritter. Gourds work especially well in fritter form. Whether it's acorn squash, pumpkin, or in this case butternut squash, it's going to be really tasty when battered and fried. Since most squashes and gourds have a similar texture when cooked, you can pretty much substitute anything you have on hand for the butternut squash in this recipe. You can also use frozen butternut squash if you don't feel like roasting one. Before you make the fritters, you may want to make the dipping sauce ahead of time so it's done and out of the way. The dipping sauce is tangy and herby and has some nice Thanksgiving flavors to it, actually. It's as easy as mixing everything together in a bowl. Whatever you don't use for a dip works great as a salad dressing. 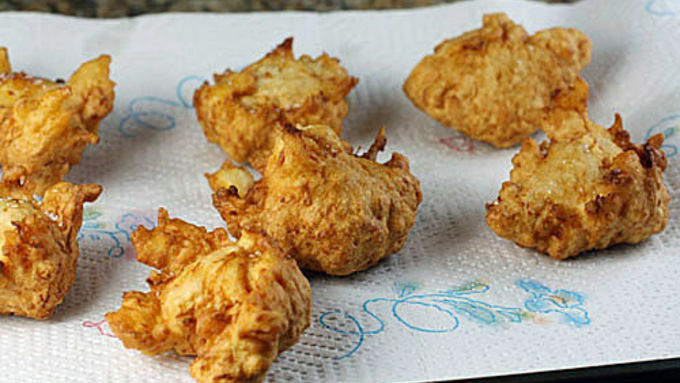 One key to making a good fritter batter is to keep the ingredients separate until you are ready to fry. If you let the batter sit for too long, the baking powder will deflate and the batter will get kind of dry. This isn't to say you need to rush, but just start with your dry ingredients, wet ingredients, and mashed butternut squash separated. 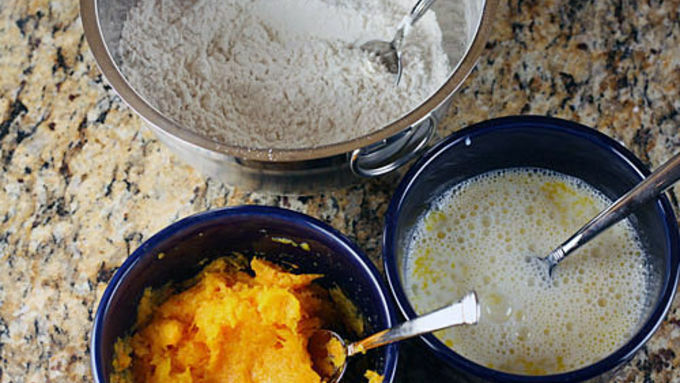 When mixing the wet and dry, it's okay if there are chunks of butternut squash. In fact, it's probably best if there are some lumps. 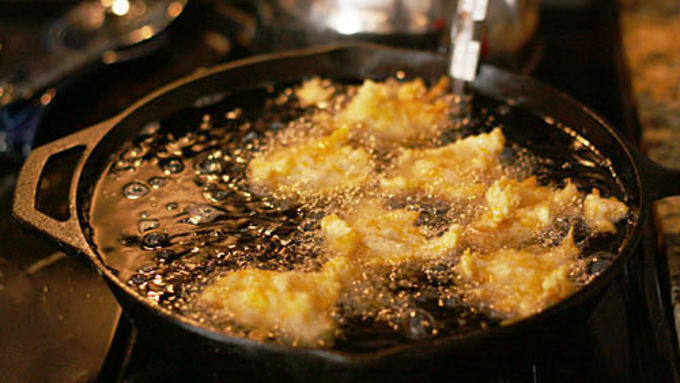 While frying, it's best to work in batches and try not to overcrowd the pan. Depending on your oil temperature and the size of your fritters, cooking time might vary a bit. Serve these guys as soon as possible with the dipping sauce. Yum!